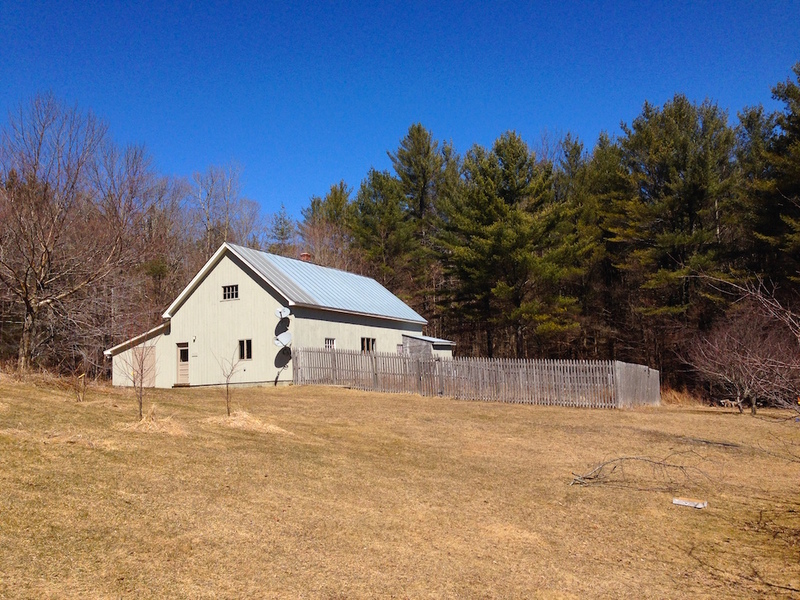 As I shared in a fit of elation the other week, Mr. Frugalwoods and I bought our Vermont homestead! If you want to get caught up on this breaking news, check out the first two posts in my homestead mania series: That Time We Bought A Homestead and How We Decided Our Homestead Was The One. Today, I’m addressing the financial aspects of our dream-come-true property. Renting out the home we own in Cambridge, MA. Purchasing a homestead in our price range. 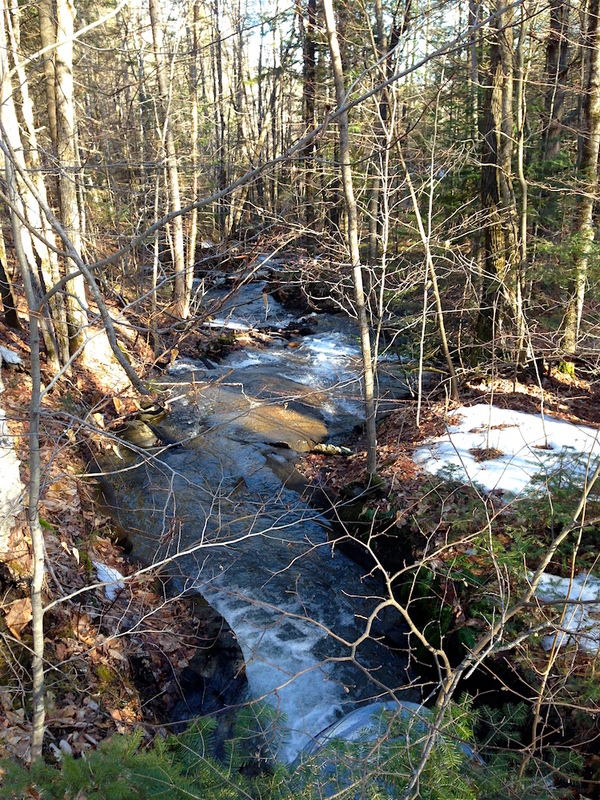 The ability to work remotely from Vermont. The possibility of someday generating income from our land. Frugal Hound’s international modeling career. 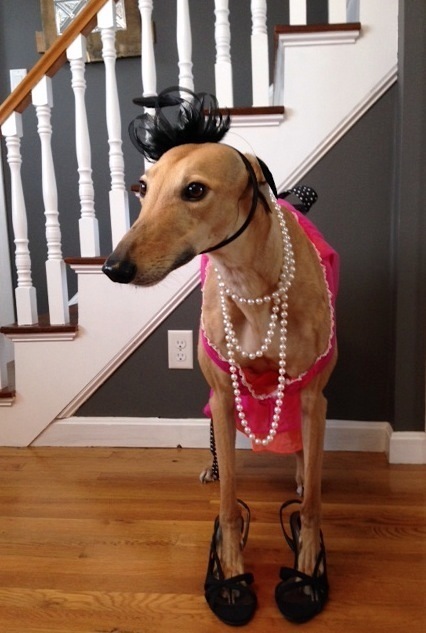 Let’s be honest, she’s one fabulous looking greyhound. Get excited people–I’ll address each of these elements in turn. 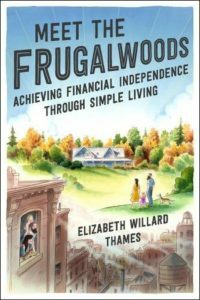 Regular readers of Frugalwoods are well-versed in our frugal weirdo style of extreme frugality, so I won’t go into depth here. In summary, Mr. FW and I have always been frugal folks and haven’t ever had any debt except for our mortgages (more on that decision in a minute). We didn’t inherit money or receive loans or cash from friends or family–rather, we’ve been circumspect savers for most of our adult lives (while working for non-profit organizations). Additionally, we don’t ascribe to an ascetic or miserly form of frugality; on the contrary, we’re in the camp of luxurious and joyful frugality. Prior to initiating operation move-to-a-homestead in March 2014, we were saving roughly 40-50% of our combined net income. After solidifying our early retirement aspirations, we began saving upwards of 70% of our net income (which does not include maxing out our respective 401Ks–read about the details here.). By carefully socking away the majority of our income each year, we built quite a nest egg, which we consider to be our financial back-up. We don’t have immediate plans to draw down on these funds anytime soon. Rather, this money–which is held primarily in low-fee index funds–serves as our fail safe (interested in how we manage our money? See this post and this one too). If we needed to, we could comfortably withdraw 4% annually from our investments in order to provide for our rather meagre living expenses. But, we don’t intend to enact that withdrawal method in the near future. We’re of the belt-and-suspenders model of early retirement–we like for our financial behinds to be well-covered. For more on the methodology of the 4% rule as it pertains to early retirement, see How Much Do I Need To Retire Early? and the academic origin for this philosophy, The Trinity Study. Sidenote: If you’re interested in kicking off an extreme frugality regimen of your own, then I have just the thing for you: take my uber frugal month challenge! Furthermore, extreme frugality works for us in two ways: firstly, it enables us to save a great heap-o-money. But secondly, and even more importantly, it permanently lowers the amount of money we need to live on each year. Extreme frugality wasn’t a one-time stunt or gimmick for us, it’s a lifelong decision to embrace less consumption, insourcing, and a commitment to not wasting our precious resources. We adhere to the ethos of: if you don’t spend a lot of money, you don’t need a lot of money. When we purchased our single-family Cambridge house in 2012, a driving factor in our decision was the possibility of one day renting it out. Cambridge is a super hot rental market–65.4% of all housing units are rented in the city, a fact perpetuated by the two major universities anchoring the city: Harvard and MIT. The transient nature of Cambridge’s academic community, along with the boomlet of biotech firms now headquartered or with offices here, puts tremendous pressure on the housing market such that rental and purchase prices are ever-increasing. We feel very fortunate we were able to buy when we did as there’s no way we’d be able to afford our house in today’s market. While we assumed that renting would be the most advantageous long-range financial decision, we had a realtor come to the house this spring to price it out for sale, just in case. It’s always a good idea to check your financial assumptions. After conducting a CMA (comparative market analysis), the realtor determined that he’d list our home for sale at $890K, which is an almost unheard-of appreciation rate over our purchase price of $466K. There’s nothing tremendous we’ve done to the home to warrant such an increase (beyond minor repairs and cosmetic changes), it’s just the nature of Cambridge’s wildly popular market. We then had several local rental brokers assess our home to determine its rental potential. They all reported back that it should rent for between $4,200-$4,400 per month. With these two data points in hand–the potential rental price and the probable sale price–we were able to project our returns for these two scenarios. Sidenote: realtors and brokers offer these in-house estimates for free, so there’s no harm in availing yourself of their expertise. In the short-term, selling our home would certainly provide a more massive influx of cash. But over the duration, renting should yield the more significant return. The capacity to purchase a second home without needing to sell our first was made possible by factor #1 (extreme frugality) and is an awesome benefit that many a frugal person enjoys–indeed, it’s why rental properties are so popular in the financial independence community. In making the decision to rent, we are gambling that over the long-term, the leveraged returns on our house will be better than the broader stock market. Certainly over the short-term that has held true as we put only $65K down on the house and realized an almost $400K equity increase, which is a crazy high return. Our projections do not assume this level of astronomical appreciation (see spreadsheet at right), but even with a relatively modest level of appreciation, our return on rents is substantial and also tax-advantaged because it’s rental income. From an appreciation standpoint, we estimate that our particular neighborhood is at about a 6.5 on a gentrification scale of 1-10 and it’s on a sharp upswing at present. Plus, the broader economic forces in New England point to this having potential for more appreciation. Additionally, renting provides us with nice diversification since the rest of our money is invested in low-fee index funds. We could diversify with a REIT, but we feel like we have a particularly good deal here and we know the area well. Mr. FW and I initially assumed we’d manage the home ourselves, but in the interest of doing our research, I priced out property managers just in case. Most of the PMs I spoke with charge more than we’re willing to pay for the convenience of having a local manager. But then I got a hot tip from a friend of a friend we met at a Christmas party about the PM they use in Cambridge who charges a ridiculously low flat rate per month. While researching on the internet is helpful, never overlook the power of asking real live people. You never know who might be a secret real estate maven or financial independence devotee! I called up the PM in question and, turns out, they’ll manage the house for a cool $105 per month. Perfect. I am absolutely willing to forgo $1,260 in profit this first year to avoid middle of the night panic phone calls from tenants while we’re a 2.5-3 hour drive away. If we were living in the same city, we’d definitely manage the house ourselves. And if we were living across the country, we’d definitely get a property manager. Our distance put us firmly in the grey area and so we’ve decided to hire a PM for the first year of our landlording career and then re-assess for next year. We’re already thrilled with our property manager as they were able to rent the house out for $4,400/month, which was the very top of the price range estimate we received from the various apartment rental brokers we polled. They took professional photos of the house (wow do they look better than my standard photography–sorry you guys are subjected to my amateur shots here on the blog!! 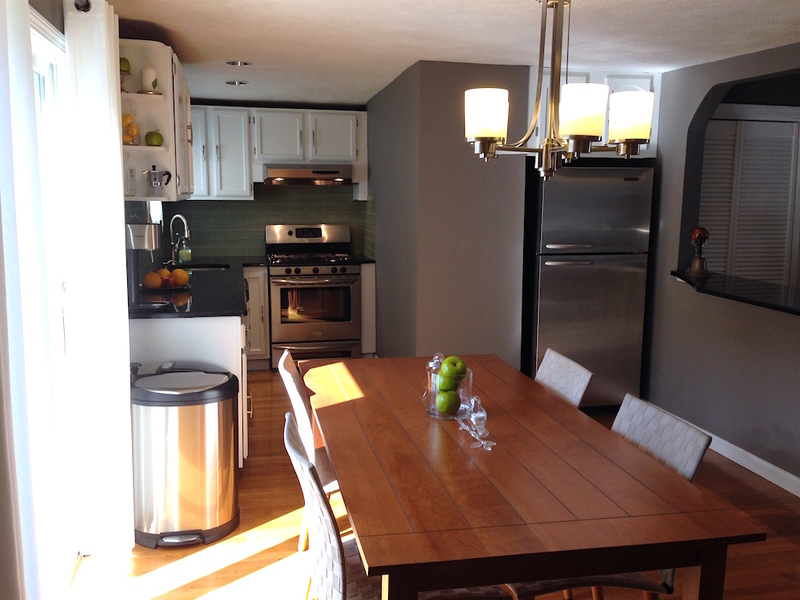 ), listed the house, brought prospective tenants through, and rented it out quickly. They also did extensive vetting (including credit checks, calling references, verifying employment, etc) of the tenants, created the lease, and will handle all aspects of the tenancy. The income from renting out our Cambridge home will cover both our Cambridge and Vermont mortgages as well as all of our expenses surrounding the Cambridge dwelling: paying our property manager, generating a maintenance reserve, taxes, and insurance. One of the reasons Mr. FW and I searched for our homestead for oh so long (3+ years) is that we were committed to buying a property that fell at, or below, our price max of $400,000. Tempting as it is to stretch one’s budget with house hunting, it’s one of those times when it’s truly imperative to stay on target. Thus, we were thrilled to purchase our homestead for $389K. It had always been our intention to get a mortgage on our homestead and so we put down 25% and got a 4% interest rate on a 30-year fixed mortgage. We weren’t able to get a rate lower than 4% because: 1) we bought it as a second home, 2) there’s extensive acreage, which makes it an unusual mortgage and hence, we needed to use a local lender. We’ll likely try to refinance once the homestead is our primary residence. And in our opinion, having a mortgage is also about managing risk. If you have a mortgage and you have a lot of cash in the bank, you have the ability to both pay that mortgage and contend with an unexpected immediate expense. Having a mortgage reduces our risk in of future potential cash flow difficulties. It’s tough to extract liquid from a paid-off house, short of selling it or potentially getting a home equity line of credit. Our intention throughout our homestead-hunting process was to buy a property whenever the right one came available. Why? Because available homesteads are scarce in the areas we wanted to move to and we didn’t want to let a dream parcel slip through our fingers. We had the fall of 2017 set as our outer limit deadline, but we hoped we’d find a place before then. Hence, we are thrilled with the opportunity we both have to work remotely from Vermont. The fiber-optic internet that our homestead comes equipped with was a gigantic factor in making us realize this parcel was the one for us. With the internet, Mr. FW and I feel we’re able to do just about anything: work, learn, create, and connect with the world. 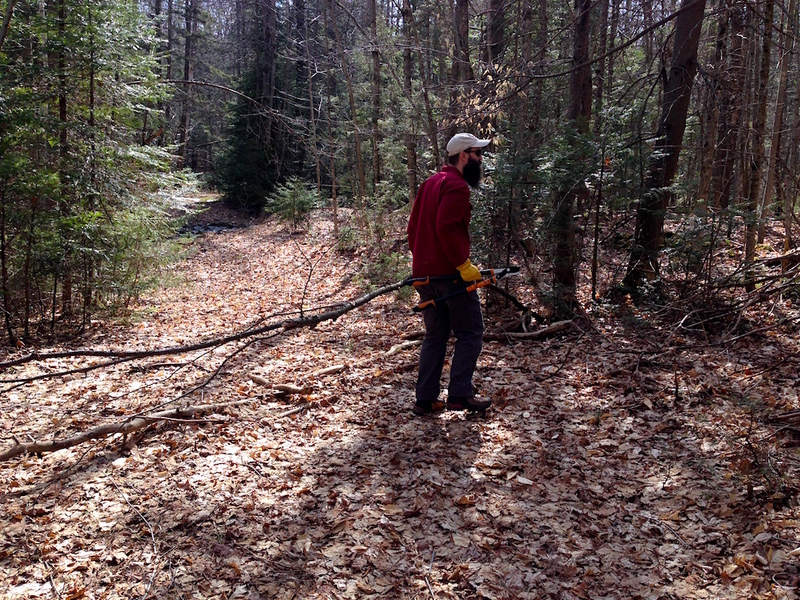 Mr. FW is infinitely fortunate to have the ability to work remotely for his current employer, which is an ideal situation as he enjoys his job, but wants to live in the woods of Vermont. I’m now working from home as a freelance writer, a job I love and am able to do during the hours that suit me (while Babywoods naps) and from anywhere (the woods!). Since I’m now working only part-time–as I care for Babywoods full-time–I don’t make as much as I did from my previous full-time job. But, the difference in my income is made up by renting our Cambridge home. We were essentially losing out on revenue every month that we lived in our Cambridge home. Since we were grossly underutilizing the asset as a family home, renting it out is by far the better financial decision. Plus, by reducing my work to part-time, we’re able to avoid the cost of daycare for Babywoods, which runs north of $2,300/month in the Boston area. 1) We’re not farmers or gardeners. Although we hope to grow our own food, make maple syrup, and harvest apples, I don’t know if we’ll ever be proficient enough to sell our products. 2) This is too variable a factor–with far too many unknowns at this stage–to deduce accurate projections. A few of the ideas we have for perhaps leveraging our land for profit in the future include: selling a farm product (vegetables, syrup, apples, etc); building a cabin to rent out on AirBnB; Mr. FW creating furniture or art through his hobby of woodworking and welding; and selling some of our timber, which needs to be harvested anyway for the health of our forest (and in accordance with our forestry plan). While these could all someday yield income for us, our immediate plans are to get the land in shape to maintain and sustain our own little family first. It’s the combination of these five factors that allows us to swing this move financially. While we certainly could’ve jumped in with just one of two of these elements in place, Mr. FW and I are somewhat conservative in our financial projections. Although we’re both risk-takers, we like to think of ourselves as strategic and judicious risk-takers. There are a million different ways to homestead, and almost as many methods of reaching financial independence, so please don’t see our decisions as a one-size-fits-all approach. What we’ve endeavored to do is address our financial needs from multiple angles because, one never knows exactly how the stock market or real estate will pan out. If, for example, our Cambridge house needed a new roof (ok hopefully that won’t happen soon as the roof is less than 10 years old… ) we could easily experience a net negative year. Hence, we’re not solely reliant upon this rental income. In this same fatalistic vein, if the stock market was down for several years in a row, our portfolio could take a serious nose-dive, which, again, would be problematic if our entire well-being revolved around a 4% SWR (safe withdrawal rate). And if all of our homestead crops go belly up due to early frost/deer/moose/our incompetence, we’ll still be able to eat and afford our living expenses. By diversifying our income and our investment vehicles, our hope is that we’re setting ourselves up for long-term financial success. And if everything goes south all at once, we have cash reserves that aren’t invested to fall back on. Finally, by maintaining our chosen lifestyle of extreme frugality, we have the comfort of knowing that we can get by on very little money indeed. And at the end of the day, that’s what I come back to–although money provides infinite amounts of security, it doesn’t equal happiness. That is for each of us to discern through our own unique pursuits and passions. How are you financing your dreams? 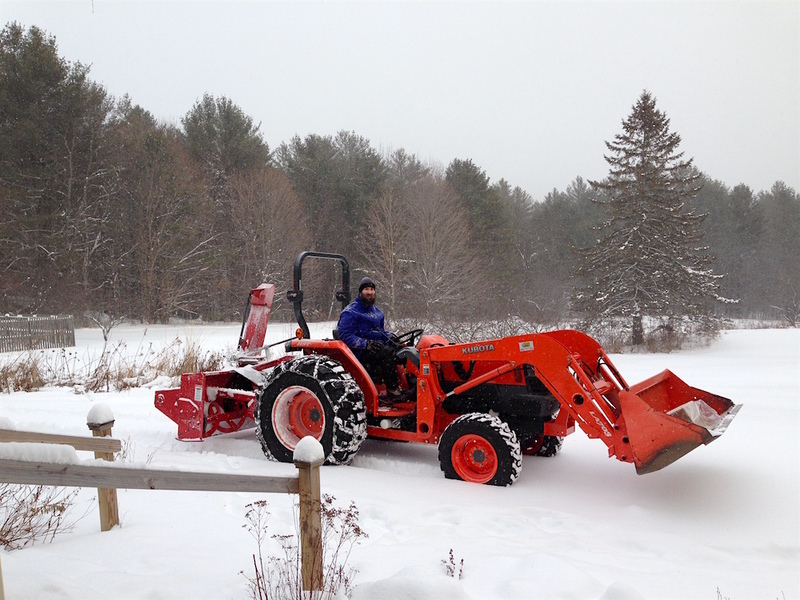 This Month On The Homestead: Snow Removal, Snowshoeing, and… More Snow! Thanks for sharing the details of your plan. The appreciation on your home is truly amazing! It’s interesting that you’re essentially “missing out” on revenue by living there. What a unique way to look at your home–but so true in your case. Thanks! Yeah, it was a great realization for us that we were totally underutilizing our house by living in it :)! Congratulations on the homestead!!!! What a fantastically well-written post, Mrs. Frugalwoods! I love the example you are both setting for your little girl, too – that with hard work and living well below your means, you can literally live whatever type of life you want 🙂 You are making me want to move to Vermont!! Our financial dream is to own rental properties and work flexible jobs. I’ve kind of lost the dream of “retiring early” as I really do enjoy working, as does my husband. We would, however, love the time freedom that comes with not having to work a FT job. We found out we are expecting baby #3 this fall, which we are super excited about! This will slightly postpone us purchasing a rental property, but it shouldn’t for long. We’ve been ramping up savings and after the baby comes and we figure out my work situation, we’ll most likely be owning a second property sooner than later. Thanks for the encouragement and tips!! And HUGE congratulations again!!! Congrats on baby #3–so exciting :)!!!! Rental properties and flexible work schedules are awesome. Having the freedom to allocate your time as you see fit is THE BEST part about working from home (in my opinion : ) ). Just a note: qualifying for the loan to buy a rental property is a LOT easier when you are both working full time before the baby is due. After you are on maternity leave, your employer may report to the Lender that you are on leave or part-time, etc. Good luck! Always pursue those dreams! Great pictures. The new homestead looks amazing. Is that a satellite dish shadow on the barn? TV in the barn seems like an interesting addition by the previous owner. Thanks for sharing how you decided to go with a property manager. It looks like you got a very reasonable PM price, especially as a % of rent! I am very interested to hear about year 2 and 3 decision to go PM or not. We have gone the non-PM route ourselves and found it an 80/20 thing. 80% of the time, we think that we made the right decision. But 1-2 time consuming things happen each year or rental contract period so about 20% of the time we sign, shake our heads, and reconsider a PM. So far we have said no to a change. Thanks! Yeah, there is a satellite dish on the barn, which the previous owner put there and which we will never use :). We’re definitely going to evaluate the PM this first year and see how we think it works out. I am so impressed by your accomplishments. What a wonderful life you have created for yourselves, beautiful Estelle and Gracie. Thank you for sharing all the financial details – it was fascinating. Good luck with the move! I appreciate your insight on hiring a property manager! I want to rent out my house and find cheaper living arrangements but I get nervous about the landlording bit (especially reading about squatters in the news!). My financial dream is to first pay off my student loans and then build up invested savings so I can retire early. I am attempting to do this by living as frugally as possible (reading your blog is a huge inspiration!). Im so fascinated by your homestead. I checked the entire week for the next homestead article. Can’t wait to read more. And don’t forget there’s Number 6 – that international modeling career 🙂 We are hoping to retire on the proceeds of our English setter’s income! Hahah, wouldn’t we all like our dogs to one day be revenue generators :)?!! You are such an inspiration! I am so happy with you, and now see possibilities for me. But I can’t seem to escape expected gift giving and non-frugal celebrations (think showers, weddings, birthdays, graduations, Christmas…) Do you just say no? How? Thanks so much! So, I have a post on that very topic: Holiday Gifts For Frugal Weirdos To Give And Receive. Hope that helps :)! Wow, sounds like you guys have things covered extremely robustly from a financial standpoint. And for a Midwesterner like myself, the amount of appreciation of your Cambridge house in four years and that renting it out will cover two mortgages is crazy. I’m also curious at what point remote work for Mr. FW’s employer became an option and how that played into the decision making process (was that always something you knew might be possible or was it only on the table once your move was imminent?). Yes indeed–we bought the Cambridge house in large part because we saw the potential to one day rent it out. I just can’t tell you enough how happy I am for both of you. Again, I say, so young and to have achieved so much. And while it does come from frugality, without a doubt, it also comes from having a brain! Two of them to be exact. Frugalhound only has good looks! But seriously, you know how to manage well the money you do earn and accumulate. I know Vermont, and you have a beautiful home and property for the price. Truly. I’m so glad you jumped on it. Mr. FW looks exactly like my husband on our tractor. But, down the road, you might want to consider a front-mounted snowblower for the tractor (we call our tractor Baby because it’s his baby) to save his neck from turning all the time. But that’s down the road. You’ve got your dream now. And you know what….your lifestyle now is exactly the life we live here in Vermont, and I sometimes tire of it and think of a condo. Maybe I need to rethink what I have and remember that it’s a dream for many people. Thank you for reminding me of that, and congrats again. And thank you also for you openness and honesty about your finances. Thank you so much, Bev :)! Yeah, our tractor has the pull-behind blower, which is good that he won’t have to drive backwards, but we’ll have to see how he likes it after a winter. It was great to see the financial examples behind how it all worked out. We’re currently saving up for a down payment on a house too, but we both make peanuts from our current jobs (hence why I’m branching out into freelance writing as well), so it’s difficult to save much. Even so, $100 a month is better than $0/month! At this rate, we’ll have enough for a 20% down payment on a $250,000 house in 41 years, and we’ll be 70 years old! Yes–you’ve hit on a good point there–increasing income is absolutely the other end of the frugality equation! You’re smart to take on freelancing to boost yours. P.S. Would you be willing to share what town you are in? If you don’t want to share that online, you could send me an email. We are looking at retiring to another home one day, downsizing our business, and just doing work out of a barn on our own property, but we can’t do that where we live right now. Too long a story as to why. Do you mind sharing the name of the town with me as well? Just want to look for examples. Retirement won’t happen for at least another decade for me though. I love the nitty gritty details – thanks! I think that’s an awesome plan. You in essence have 4 sources of income (1) Mr. FW, (2) Mrs. FW, (3) Cambridge house, and (4) index investments. I think your plan is extremely safe and would stand any blips in the overall economy. Congrats! Super congratulations!!! Much happiness to you. Congrats, congrats! I must say that the price of both your Cambridge home and your new homestead made me choke on my morning tea. (I’m from central Maine where the housing prices are much, much lower. But then so are the wages.) How do people making low or even average wages find affordable housing when the prices are so high? There is only so much frugality one can employ. I know this is getting of subject, but son of a biscuit! Ah – I love reading about your achieving your dreams. I love that you hired a property manager – we helped a grandparent manage a Somerville triple decker and it was awful living just an hour from Boston. The tenants locked themselves out, broke things, etc, etc. We were constantly fielding their calls to help them with their issues. We had younger post grads so hopefully your tenants will be older and more responsible, but $105 is a steal for the peace of mind!! Wonderful piece! Thank you. I do have one question. What is the difference between homesteading and just moving to another home you intend as your permanent residence? Any farm animals in the future? Maybe down the line…. we’ll see :). We want to get settled first and make sure we know what we’re doing with the land before we add more variables. Can you give the name of the PM you hired? I too would love the name of the PM you hire if you feet comfortable sharing it. Sure! It’s Senne management. Here’s their website. Congratulations! My heart is swelling with pride for you. We are in early days saving for the same dream. I knew of a housing development built in 2006 where everyone let their house go back except the one sad guy who paid cash. I think you made a great decision to finance, and for exactly the right reasons. I wish you had explored with us the decision to go with a 30 instead of a 15 year mortgage – that is a big surprise to me that you did so. I’ve walked around for three weeks saying “66 acres!”.. I can’t speak for the FrugalWoods, but several of our friends went with 30 year mortgages for the safety of it. They are paying as if they have a 15 year mortgage, but they have the flexibility to drop back to lower payments if they get in a financial crunch. It will cost a bit more in the long run but provides security. I love you frugal weirdos. It’s so fantastic to see the real results of not being blind consumers. I’m interested to see the income streams you guys find for the homestead in the years ahead. Haven’t checked your site in while and so much has happened. 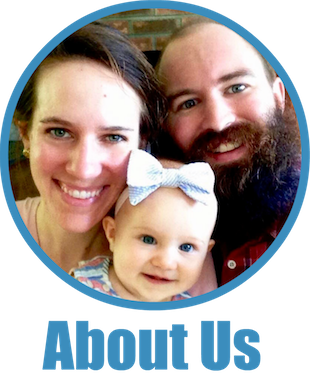 Congratulations on your homestead and on your baby! Congrats on the fortunately hot rental market in Cambridge! Looks like you bought at the right time, and should be able to have diversified cash flow. The PM price certainly does sound like an incredible deal for the area. I like the thought of telecommuting from the woods! How much time would you expect you’d require to maintain the land and even driveway out to the road? Probably a fair amount of time, but that’s exactly why we’re moving there–we want to work outside :)!! As to having the homestead pay for itself, one word: Frugalwoodstock: the northern hemisphere personal-finance chautauqua, for those who cannot make it to Ecuador. So exciting! Thanks for the peek behind the finances. Gardening is the best, isn’t it? We’re currently kicking around the idea of planting fruit trees and bushes. We only have half an acre, so we have to be strategic with our set up. I can’t wait to hear more about your growing and homesteading. I love all of the details and research you have put in to this. I think it is smart to go with a property manager. My mom rents out a house in another state, and she did not have a property manager the first two years. It was a disaster. She ended up having to evict the tenants, sue them in court for lost rent and damages, and then had to pay quite a bit to repair the damages they had done to her property. She now uses a property manager for less of a headache. I think the extra money is well worth not having to deal with calls in the middle of the night! 🙂 Also your Vt homestead looks fab! I’m curious too… I work in non profit development and while development is one of the top paid sectors of the non profit world (I’m no Director, so I don’t fit the bill, ha), you haven’t mentioned your sub fields in non profit. Would love to know as perhaps I should switch focus, lol! Perhaps Boston area is a better paid area for NP folks? Also, I’d be curious to know what you all would do if you were in Boston area now at the age when you bought house. Since homes have increased in price dramatically, what would you do instead? Would you switch areas? Since high home costs are a serious issue in most major cities where young folks have flocked to (NY, Boston, LA, DC, etc), it would be interesting to see your takeaway on a smarter course of action for young people today. All good questions. I have a few posts that address these issues: Career Management: How We’re Reaching Financial Independence On Two Nonprofit Salaries and The Ultimate Guide To Frugal Boston Living and Before We Were Mr. and Mrs. Frugalwoods. As I discuss in these posts, income is the other side of the frugality equation–you’ve got to make money to save money. We do indeed make good salaries and I’m all for people managing their careers in order to facilitate a financial independence goal. Also, Boston does indeed have higher salaries–it’s one of the main reasons why we’ve lived in cities (Boston, NYC, DC) since graduating from college in the midwest. I used to live in NYC, and contrary to your statement, a lot of non profits actually underpay employees and get away with it because there are so many people looking for jobs who are willing to take low pay. Unless you’re top level, you can have difficulty getting a good salary. But I agree, job-jumping is key. Also, I was more curious about your actual positions? Not title, just field. Those linked articles don’t mention what you two do in non-profit. So so happy for you. We practice frugality- although not as much as you. Our savings rate varies between 40 and 60%. Not bad. We are actually in the process of selling two of our rectal properties. We found the headache of being a landlord was not worth the income. Epically when you consider capital gains. Plus the market is so hot, we should be able to get a great price. We are going to use that money to pay off our current mortgage and take out an equity line of credit for emergencies. Then we’ll invest everything we’ve got to get to our 4% sage withdrawal rate. WOW! You two are amazing. Sounds like a great plan! It is so inspiring to read about your homestead. As usual, this is a very helpful article. My partner and I are on a very similar journey, though on the opposite side of the country. I’m curious if the mortgage penalty for a second home you mention is related to having two mortgages or two homes? We will eventually be making the sell/rent decision for our current home, which has no mortgage, once we’ve found out dream homestead. This was fantastic. I was anxiously awaiting this post. Cambridge is as crazy as Santa Barbara! I’d say that our house (2br1ba, small, cheapest single family) was probably similar. At the bottom of the market, prob $480k. Neighbor paid $500k. However while it’s come back, it’s not over $800k. Maybe $775k, which is still less than we paidiin 2004. Bad timing. The rental market is hot here to, but not that hot. Probably because we aren’t in the best school district. We could probably only rent it for $3000. I have to say, I’d have a hard time not selling at that price. But on the other hand, owning a home and renting it out has turned out to be a good long term thing around here. It’s a good bet. And you can always sell it later. LOVE this! I am in love with your new home. It is absolutely beautiful. You two are so deliberate and thoughtful in your decision making. I love it. I’m developing those habits now, but I’m implusive by nature. I’m so happy for your homestead life! And with spring and summer coming up, you’ve moved at the best time! How exciting!!! It sounds like you have the perfect circumstances to make this move! I’ll be eagerly watching as you continue to build your dream! Loved this article bec this is what I am interested in and how I invest my money but I do land contracts. This way I do not have to pay the homeowner’s insurance, city tax,county tax or repairs. I am allowed to charge interest at what ever the government allows. At present it is 7%, 10% late fees, 10% on equities that I pay up front and buyer repays me. Downside is when property pays off. So this is where being frugal comes in again by saving the income from the land contracts to reinvest. You can also do a wrap around-where you borrow the mortgage money, sale on land contract, then take this money and pay on the mortgage. Of course you would charge a higher price/month to make it worth your while. I have been doing this for 30 years and it has served me well. Great to be following your journey! The land looks beautiful. Would love to see pics of inside the house when you are settled! My daughter is a little older than babywoods (20 months now!). Will you be home schooling babywoods or are there schools in the area? Just curious! Thank you! I have both an answer to the schools question and interior photos in this post: How We Decided Our Homestead Was The One. Enjoy :)! At 67, I envy your choices and smart thinking. Wish I was your age and able to complete the life you are working on. At this time in my life, I just read every post and marvel at your wonderful and level-headed decisions. My frugal life did not begin until after retirement. My bad. However, I am on the right path now and I am amazed at how mindlessly spendy some of our friends are who complain they are always broke. By the way, love your rice and bean recipe! It’s like Airbnb for camping. In addition to doing a great job of listing traditional state/national park campgrounds, it also lists private land where people can camp. People rent out yurts or cabins or even just flat areas for setting up a tent. Could be another way to generate income on your new homestead. Very cool! I hadn’t heard of that before. We’re definitely ready-made for camping. Thanks for the tip :)! I’m financing my early retirement dreams with $4k per month of dividend income. That’s usually more than enough! Great job and congrats on the homestead. I live right outside of DC, so it was interesting to think about the idea of underutilizing an investment–a family home. Definitely has me thinking! I’ve also recently (last year) transitioned to working part time from home and caring for my baby, and its been both challenging and wonderful. Good luck with the road ahead! I really enjoyed this post! Man, you are making me wish that we had bought property during the recession, although at that time we weren’t living in a place that has boomed like Boston has. Is it bad to root for another huge housing market fall in a few years so that I can swoop in and buy something at a good price?? Anyway, it is amazing that rent from one property can pay two mortgages plus fixed expenses. You guys made a really great choice with that house! I would totally come stay in your hypothetical AirBnB cabin! As for us… we’re still figuring out what our dream IS. Mr. FP wants to travel a lot. I want to plant a garden and keep chickens. Negotiations ongoing :-). Ok here’s the solution: travel to come stay with us and help me in the garden!!!!! We are trying the Airbnb thing to finance our dreams! We put $15,000 into a rental unit in our basement (completely new) but have $1600 in airbnb income coming in the first month! We had cash for the initial expense, so we should be able to put all that back within the first year, and after that it will pay for our mortgage/taxes (we are in GA so not nearly as expensive as Cambridge). We’ve had great guests so far, might be worth considering if you do research into Airbnb or VRBO rentals in your area. Boston sounds crazy in terms of cost of living with the rent so high, plus childcare at $2,300/mo. That’s like 2 minimum wage workers working full time! Can’t imagine how a working class family deals with it unless there are good state daycare/preschool options for free or cheap. But it looks like you’re escaping the crazy house and benefiting financially as well. Kudos to you both! Yes, you hit the nail on the head: it is crazy-town cost wise. Escaping the crazy house lol…I love it. We escaped the crazy house too, the year before we had our first child. We were doing better than working class (2 engineering salaries) and we would have been downright broke if we had stayed in MA and paid for daycare. There are no free daycare or preschool options that I know of in MA, at least not in the town we lived in and not in the town my sister lives in. Heck, in our town Kindergarten was only half-day and you had to “lottery in” to and pay tuition to get a full day (public school)! One small thought on selling produce: my MIL is friends with a farmer in her area who sells at the farmer’s market each week. My MIL planted four rhubarb bushes in the hope that one would survive, but they all lived and each year she ends up with a ridiculous amount of rhubarb. She sells the extra to her friend, who in turn sells it at the farmer’s market. The farmer makes a slightly smaller profit, but then she doesn’t have to grow rhubarb and it’s essentially no work for her. Perhaps you could make connections with farming neighbors and do something of the sort when you get your garden area up and running? $10 here and there for a few extra fruits and veggies isn’t much, and farmers near you might not think it’s worthwhile to sell in such small amounts, but it’s worth a try. Especially if it’s a crop that either they themselves don’t grow, or one which is wildly popular in the area and frequently sells out. Totally! There’s a farmer’s market close to our house in the summers, but we’ll just be customers the first year :). Good to get out of Cambridge while you can! I have relatives in Arlington. They’re looking for a house, and they start at $400k for a “condo” (half a house). A real house is nigh unaffordable and takes an enormous down payment. Although we’re starting out at MUCH lower housing prices here in the Albany area, the rent of our investment property also covers that mortgage and the mortgage on our own home. And I agree with your decision to get a property manager. I wondered how you could possible manage it from Vermont. I have a post on Monday coming up, a little bit about the same thing, what our diversified income stream will be when our options start opening up in a certain amount of time.. Yes indeed, Arlington is super duper expensive too. We looked there as well when we were hunting and the prices are almost as high as Cambridge! $400K for a condo would be a pretty good deal honestly! I’ve been following your plans to buy a homestead for about a year now, congratulations! My family is considering a move from a HCOL to LCOL area, and we love your story. Thank you! Wow. Didn’t realize Cambridge real estate was that hot. A great set of contingency plans, safety nets and lots of flexibility. The ” kid ” looks to be having fun on the tractor…. I hope your property manager isn’t Greenlight. They are terrible. They are not, which I guess is good! Be sure to check into having your property classified as a working ranch for tax purposes. It might be worth paying a CPA for the first year to make this happen. It may drastically reduce your taxes if you’re able to show a (meagre) return–say $800 worth of lumber or something (e.g., sell some Christmas trees on your property). Great story – did you consider the tax implications of zero capital gains on the 400k + that you would get if you sell as a personal residence….if you have to sell after 2 years then all that would be taxed and it would be a very high rate…and there is the depreciation capture tax on top – would make me want to take the money and run! Yes, we did think about that and we still have the two years to change our mind :)! Over the long run, our calculations project a greater return from renting, but we will certainly re-assess every year. Congrats on the homestead! I’m behind on blog reading, hopefully you’re still active in the comments here. What do the #s look like if you take that crazy awesome tax free gain and buy another house (or 3)? Given there are (somewhat avoidable) transaction costs to sell/buy, that tax free gain is just huge. Looking forward to more homestead posts! How long have you been moved in to the new place? 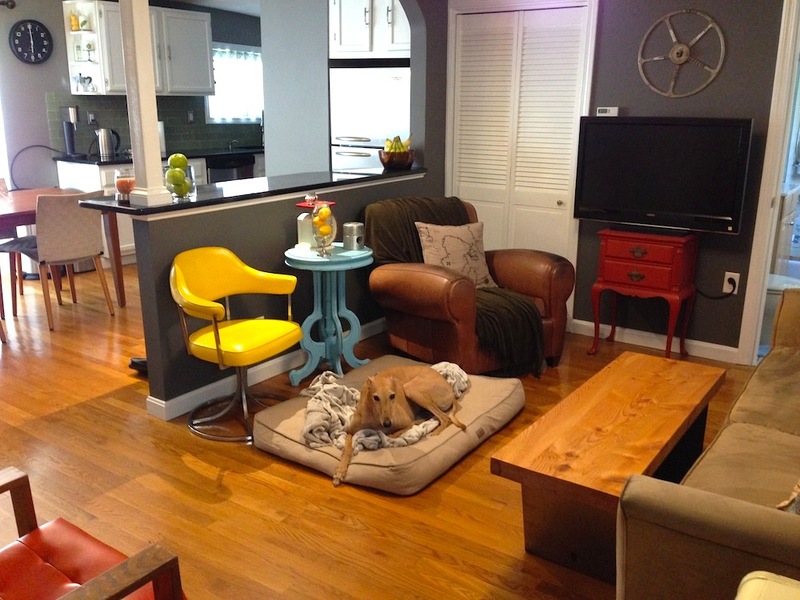 Or have you already rented out your Cambridge house before the move? So many major life changes all in the same year – so happy for you! 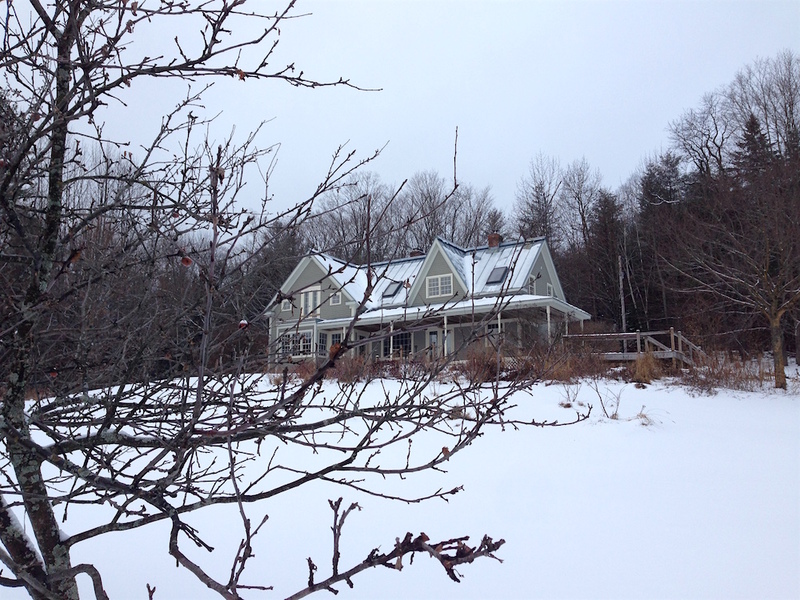 We haven’t moved to Vermont yet, but the Cambridge house already has a lease signed on it. We’ll be making the move soon! very new to frugality….our first step was to stop buying lattes every morning, we will save enough for a flight to Europe each year. thank you for your detailed plans and honest approach. That’s an awesome first step! Way to go! And I love that you have a specific goal in mind for your savings–I think that makes it much more tenable. Good luck!! Jane its hard going to get started but totally addicted to tracking every dollar now!! When I do buy coffee its a massive treat! Wow. Didn’t realize Cambridge real estate was so hot. Like the contingency plans, safety nets and loads of flexibility. Wonder if the big kid will use the tractor for land work and play!! Cool post! It’s fun to read more about the breakdown of your plan. You have also reminded me to be grateful for my $700/rent in Cambridge — I do have housemates, but honestly the rent is still way lower than it should be and I have no idea why. Man oh man, is this an expensive area! Aka, an extremely smart investment on your part. 🙂 Congrats on getting everything squared away and finding an affordable property manager! Holy cow, girl–$700/month is amazing! Never move ;)!!!! Kidding. Sort of. Congratulations on the homestead! (and the baby – don’t know if I’ve commented since then.) And thanks for this detailed post. My husband and I are doing some thinking about our financial situation and it’s really helpful to read about your own process. Excited to keep following your journey! Great deal on the property, all that for just under 400k that was amazing! thanks for sharing the details such a nice place to live guys! congrats again. Love reading updates of your journey ~ how exciting! I think the diversification of your income is so smart, especially in the early days when you aren’t really sure what to expect. As you go along, you can see what works/doesn’t work and make adjustments, right? Congrats again on the new homestead–it’s beautiful! No more yurt discussion. Have you decided against this? Where will Babywoods go to school? We moved to land and now need to drive in to school. This added to our car costs etc. Great post. I find myself asking myself a lot of important questions after reading many of your posts. Thanks for sharing your experience! I found your spreadsheet of renting your house impressive. It covers everything! And what happened to hiring out beautiful Frugalhound as a top model? I’m sure you could make money hiring her out for movies and such. Seriously! And maybe even Babywoods. They ARE both beautiful and photogenic. You are wise to have a property manager. My late uncle owned rental properties and, even though he lived in the same town, he *always* had a PM. He believed it was a good investment to have someone else get the call that the water heater was leaking at 2 AM on Christmas day. The other thing is, a PM can be your eyes and ears. So think long and hard before ditching the concept. Uncle Richard said it was money well-spent. Having been landlords for two years now, I will say that I do sometimes dream of having a property manager. 🙂 I think it’s smart you guys hired one, especially given that you can’t just get down to Boston the next day if something urgent pops up. And I know you’re already closed on your mortgage, so offering this in case it helps anyone else. We had the same situation of keeping a city place while we bought our mountain “retirement home,” and we convinced the bank to do a mortgage on the “second home” as though it was the primary, because we planned to move in full-time immediately. We had to write the bank a letter certifying that this was our intention, but then we got the far better interest rate of a primary residence. Always worth a shot! We’re hoping this time next year, when I am done with my master’s in nursing, I can find an online teaching position to supplement my part-time WAH job, and get closer to mortgage payoff/investment goals. Those goals will get a big boost just from not having to pay mass $$ towards grad school tuition. Location….location….location….Sounds like you guys did great. IMHO I would think LOOOONG and hard on selling versus renting, Might want to think about the benefits of taking the $500K homeowners capital gains exclusion available IF you live in the home two of the last five years . I have been a LL almost 40 years and the returns aren’t what they used to be. On the other hand you could take the proceeds from a sale and put it over at TIAA-CREF, for them to work their magic. Some years are better than others. I have realized gains as high as 34% and as low as 3%. The point is at a 10% return (conservative) that’s $50K a year WITH no responsibility for others. Couple of things….please notify your insurance carrier immediately that the home is now a rental. Otherwise coverage could be in jeopardy. It will be a bit more expensive…..And please familiarize yourself with the “lead-based” paint registration and inspection process…THIS is HUGE especially in Mass. And $105 a month management fee sounds awfully cheap on rent of $4400, might want to read over this agreement carefully. In this “neck of the woods” management of rental property goes anywhere from 7-10% of GROSS RENT PLUS expenses. You can always take “the windfall” and buy or “like-kind exchange” property that you deem undervalued. This is a remarkable increase in value and common sense will tell you it can’t go on forever and may even contract. Just look at the impending move of GE out of Conn. those RE values are taking a big hit and they haven’t even moved yet. While I wouldn’t worry too much about a huge contraction in Cambridge, I wouldn’t be a landlord in MA for all the money on the planet. Renters have ALL the rights there. I watched my old boss go through 2 years of heck trying to evict a deadbeat, squatting tenant from his Jamaica Plain condo so he could sell it. He was in and out of court all the time trying to get them out, and yet the judge would let them stay…squatter’s rights 🙁 Growing up my dad was also a landlord in MA, and just watching that was enough for me to say no way. MA just isn’t an easy state in which to evict a bad tenant, even an non-paying tenant. I’d take the tax-free capital gain and run! In some areas (like FL, where I live now), it’s actually possible to evict easily and therefore is probably an OK place to be a landlord. In MA it’s an unbelievable nightmare. I saw it over and over while I lived there. The law favors the tenants, and they can stay for years making up the kind of garbage you experienced. You are lucky that you got them out in only 6 months, and you are lucky that they were even paying the rent to be escrowed. Like I said before, my boss was at 2 years and counting of a non-paying, squatter “tenant” in his Jamaica Plain condo and he couldn’t sell it without getting her out. The judges had no sense. He was still fighting to get her out the last time I talked to him. MA has some messed-up laws that allow this garbage to happen. I’m hopeful that the Frugalwoods have really good tenants and never experience any of this. I’d still take that tax-free capital gain and RUN though!! I hear ya Christine. I too hope the “Frugalwoods Family” avoids all this drama. In this neck of woods , in the Free State, where “nothing is free” it REALLY depends on the county or city you are in. My DM’s place is located in a somewhat “pro-tenant” area and it can take some SERIOUS time. The only reason I got the rent put into escrow controlled by the Court is because I insisted….and almost got held in contempt and fined because I was so insistent. The last Judge made short work of the whole mess after a glance at the file. In the area I live in the “shenanigans” are somewhat limited in Rent Court. I have had people out in as little as 17 days….it was a VERY GOOD DAY! Best Wishes…. You two are doing life right. Amazing and inspirational! Question – how did you learn about investing? I’m OK with not spending but I have no idea where to put my money. Great analysis Mrs FW! Very thorough and appreciated. It sounds like you couldn’t have bought the Cambridge house at a more ideal time. What a value, unbelievable. The PM seems to be the best route. What a convenience having them do all that professionally and that has to be worth the peace of mind. I have loved following along with your homestead series! We live a nice paid for home in downtown neighborhood right now. But we constantly toy with the idea of of Montana homestead. As our 5 kids get older, a bit of extra space could be nice! It has been great to see how you both are making that happen. I am hesitant to take on a mortgage, because I really love not having one. But you make a good point about investments and interest rates. Hum… It gives me lots to think about! Thanks. Renting is almost always better than investing in the stock market. 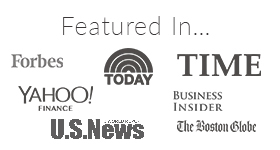 (shameless plug) I have a great article about it on my site. But honestly, you miss one major piece of the puzzle. If you sold your single family and used the proceeds to buy 3 or 4 rentals, or even 5, you could get appreciation on 4 or 5 buildings and dramatically increase your rent income. Have you thought about buying some property in central MA where prices are lower and rents are higher as a percent of property value? Great article. It is interesting because my grandmother had a house that they bought for $195,000 when grandfather was alive. When he passed away, the house was priced to sell at $725,000 and getting offers in an area similar to Cambridge. But she became sentimental and did not want to sell it assuming that value would only go up. So she kept it even though my brother in law who is a long time realtor strongly suggested we sell it. 10 years later when she passed away, the market had swung down dramatically and my mother and her siblings sold it for $375,000 after it sat on the market for a year and it was a lesson to all of us in our family. Don’t assume anything about the future of the market. Ever. It definitely can jump down just as quickly in a short period. To say that you inspire is to say nothing. I’m very happy I came across an article about you about a year ago. I expect your every post. I would really appreciate if you share your thoughts on the following. Thanks to your blog we started saving circa 60% of our earnings and saved up some amount. We have a small mortgage for our current property. While I know that your experience is to invest cash into whole market low-cost index trackers, what do you think of investing into property? We also live in a high index area but in the UK. On one hand, isn’t property investment (even if all rent will be spent on mortgage, maintenance, etc. ), a self earning option. For example, current 80K thanks to the rent let’s say in 15-18 years will be mortgage paid off amount+property price increase. Basically, loaned money earns money. While we can still invest circa 60% of our monthly savings into trackers. While with trackers only no earning on loaned money? What do you think? Or is it a matter of personal preference? Thank you very much! Well, I am in Hanover for the week til Saturday! I figured since this was your turf, I’d give you a ping and see if there is anything that I absolutely must do while I am up here. I am up here for work, but free after working hours, so I figured I might give the App trail a little looksy, and do the whole covered bridge driving thing, but anything else? This is great and congrats! One quick question from your spreadsheets: how are you calculating cash flow? How is different from your net? Hello Mr and Mrs Frugalwood. I love the blog! I’m a little bit confused about how you use your index funds amongst all of this. I’ve noticed on a few blog posts that you say you have index fund investments but I’m not sure if these are in your 401k (equivalent to kiwisaver here in NZ) or if you have them in separate accounts. You have recently purchased two used cars which equate to 15-20k so also not sure where this cash came from. Reason I ask, is I have a similar system to you where I keep 2-3 per month in my checking account, put everything for the month (groceries, petrol, etc) on the credit card then pay it off in full each month. I then have an investment property where all my spare savings go into paying off the loan, but am thinking of having a bit of money set aside for car replacements, wedding expenses, going down to one income when children arrive that we are considering putting 10-20k in an index fund on the side. Would be great to hear your thoughts! Keep on blogging. I really enjoy your posts. Hi Elliot! Our index funds are completely separate from our 401Ks, then we have a separate cash account, which is where we draw from for things like our cars. So, we have four accounts total: a brokerage account (which is where the index funds are), a checking account, Mr. FW’s 401K, and my 401K. All of our income is deposited into the checking account and from there, we move money into our brokerage account. And, we can liquidate index funds at any time, with no penalty. Hope this helps :)! The homestead is stunning! I might have missed this, but how many acres is your homestead property? Luckily here in Texas the land costs aren’t quite as much as they are in the North! We’re purchasing a house soon, but our ultimate goal is to pay it off, rent it out, and move to the hill country to homestead. Can’t wait! Congrats to you guys!!! You are an inspiration. Can you write a post regarding freelance work in the future? 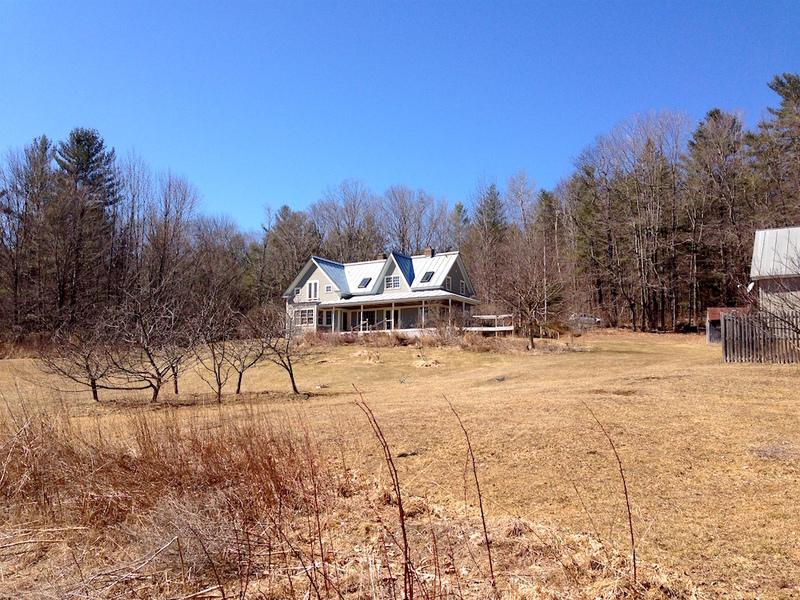 Congratulation Mrs. Frugalwoods on your VT homestead. I will miss our Wednesday chats at Prana. As our last kid is finishing college I am ready to enjoy a more frugal lifestyle and enjoy all of the information you post. Hi Liz!!! I miss you at Prana too!! Come visit us here in VT :)! What a wonderful home and property-good luck. As a long term real estate investor I would just say your numbers look promising… A couple of thoughts ..
1) I’m sure you bought an umbrella policy. 2) Congrats on the low cost property manager – exactly how many times per year will they be visiting your property for inspection.? 3) as a long time gardener – even if you don’t grow anything else this year try some spinach and lettuce … You can grow a late season crop -probably seeding in early August. It’s easy and oh so good. I have been reading your blog for years. Thank you for all your inspiring writing. My fiance and I also want to build a homestead. Despite living in a city now with 1/8 of an acre, we’ve planted 19 fruit trees and about 1,000 sq. ft. of vegetable gardens. It’s been such an exciting project! We are now going to be moving because of graduate school in another town. Therefore, we will be renting our current home. I wanted to know if you could explain some of the components in the spreadsheet that you made for your Cambridge rental. I have been working on creating a spreadsheet to figure out our profits and expenses for our rental home and our future rental apartment. For example, how did you determine your vacancy rate? Is the column rent-v literally rent minus vacancy for the year? What is M-Rent? Have you continued to use this spreadsheet over the years since renting? I want to create something that is easy to use and a resource. Thank you for your help! Congratulations on the book! I would have liked to see in one chart side by side comparison how much your mortgages with property taxes and insurance is, etc. and it would be easier to see for your readers. I would also assume a 2.5% increase in yearly property taxes, living in MA and being on my town Finance Committee, towns always go to the full 2.5% especially with aging infrastructure (think roads, sewer, equipment replacement, salaries and benefits, capital repairs and replacement (town or city buildings) etc. Plus in country living you use more gas, but insurance is less. By owning your Cambridge rental is great way to diversify your income stream and not be reliant on bank interest rates and stock and bond market returns. It does come with risk, but it appears that you have that covered with your property manager, which is a small cost for the service they provide. How can you withdraw 4% annually from your investments before retirement? Do you mean you could sell some stock? Sorry if that is a super dumb question!